Today is Vincent van Gogh 166th birthday. While he was relatively an unknown in his lifetime, he is one of the most beloved artists of our time. He continues to inspire – not only for his amazing paintings, but for his understanding of the human spirit, of recognizing the need to belong within nature, to find contentment in sharing joy and love. Vincent van Gogh is my third post in the series, “Artists in the Garden” an exploration into the connection between nature and the creative spirit. 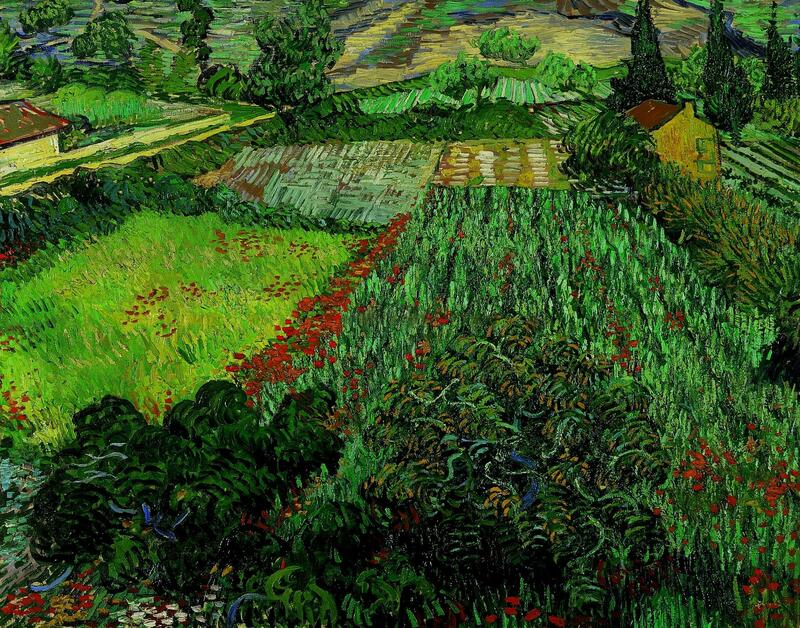 Vincent van Gogh did not have a garden, but he created them on his journeys. 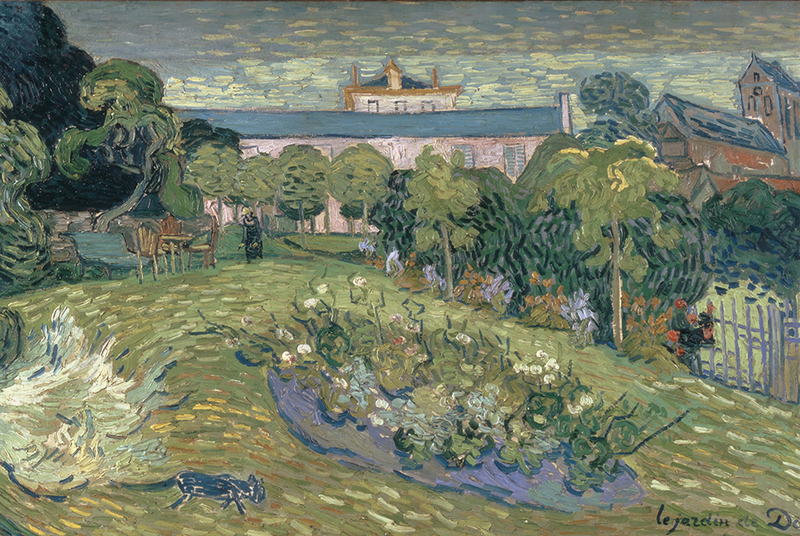 When Vincent van Gogh visited Charles François Daubigny in Auvers, July 1890, his first mission was to paint Daubigny’s garden. 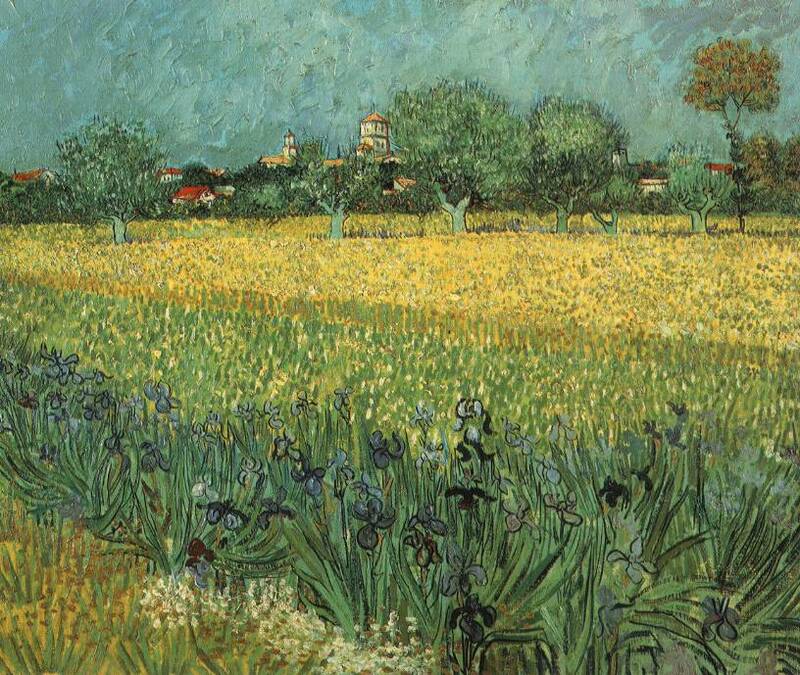 In May 1888, Vincent van Gogh captured the landscape of Arles, France, creating a spring garden of yellow and purple. positioning houses in the background. A community surrounded by nature. In May 1889, Vincent van Gogh entered an asylum in Saint-Remy. Vincent van Gogh created approximately 2,100 artworks, including approximately 860 paintings within a span of one decade, most of which were completed in the last two years of his life. He may not have been a success commercially during his time, but his creative spirit endures. In today’s world, Vincent van Gogh’s artworks rank with the most expensive paintings to have ever sold at auction. Even so, his legacy is more poignant and profound. Vincent van Gogh’s greatest gift is found in his thoughtful and reverent understanding of humanity’s need to feel complete, to be at peace within nature, to experience and share a deeply felt love that transforms our lives and those around us. Fabulous post, Rebecca! I feel like some spring came my way, today! Thank you, Resa. I’ve just started a podcast and used this post for one of my episodes. I’m just starting out and am trying to figure it all out. Having fun. Hugs. Interesting… a podcast. I’ll check it out! Listening now! You have a wonderful voice…. with Tea Toast and Trivia! One day I’m going to figure out how to podcast and connect with people from a distance. I woke up one day and, after reading the news, turned to my husband and said, “I’m going to create my news station so that I can remember that there is so much beauty and love that surround us.” Thanks for adding beauty and joy to my day. Your joy is my joy! Now following Tea Toast Trivia. I’ll be back! Rebecca, a beautiful post about Van Gogh and his great spirit. He had an intuitive understanding of people and our relationship with nature, the power of love transcending all. I like the quote from him that: ‘“The more I think about it, the more I realize there is nothing more artistic than to love others.” What a wise man, incredibly gifted and so much completed within such a short time frame. Truly astonishing. I have been a couple of times to the Van Gogh Museum in Amsterdam and it feels like a pilgrimage to enter the building. The first time I saw his paintings I felt like I’d been punched. It was an awakening of the spirit! Absolutely magnificent. Thank you for sharing more about the artist and his deepest reflections. How wonderful to have the opportunity to visit the Van Gogh Museum. Pilgrimage is a perfect description. What I find so amazing about art is that we connect with someone who we may never know in reality. With the conduit of art, we are able to transcend time and space to engage is a deep conversation that adds to our life experience and encourages us to take on a creative perspective in all that we do. Your last post on what you son is creating was life-affirming. The next generation continues an artistic journey. Exciting!!! Indeed, it is exciting to see the next generation of artists … and I’ve been moved and awed by some of the paintings and photographic art his friends have been creating as part of their coursework. If anyone starts to knock the young people of today (or any generation) they have me to answer to! Talking about the Van Gogh museum makes me want to visit again – only a short hop by plane across the North Sea! It felt life-changing and as you say, life-affirming. Ich anteil ihre geschmack von vincent transporter gogh. Ich bin froh die er schrieb viele von seine gedanken in briefe an seine bruder, theo. Ich verstehen seine gemälde da er geteilt seine innerste gefühle. Thank you so much for this article, which adds so much my understanding of Vincent’s religious zeal. I did not know that he fell hopeless in love, which was not returned. Sigh…. A complex human being, Rebecca; which is quite evident in his multi-faceted brushwork within each painting. Quite extraordinary! I agree – a complex human being and extraordinary, especially since he experienced bouts of sadness and loneliness. Perhaps that is why he understood that love was the energizing force for possibilities. The idea of “belonging” is a conversation that we need to embrace, with ourselves, our families, our friends and communities. Thank you for your comments – so very much appreciated. Extraordinary art, extraordinary comments on love, extraordinary views on nature and of course, an extraordinary man! Can you imagine the creativity, even doing a beautiful painting on a towel. He left us with active encouragement from his life, his talent, his example. Thank you for this really inspiring essay, it really helps us to make our own creations in various ways. And, from the example from our birthday boy, let us learn to love others honestly and faithfully. How very well said. I agree wholeheartedly – let us learn to love others honestly and faithfully. I am glad that Vincent wrote many of his thoughts in letters to his brother, Theo. I understand his paintings because he shared his innermost feelings. A reminder that we must continue to write and engage in life-affirming conversations. Great portrait of a fascinating and complex human being. I am delighted that you stopped by and celebrated Vincent van Gogh’s 166th birthday with me. What was truly amazing – he was able to articulate his thoughts in writing. This is a reminder to us that writing is an essential if we are to transmit thoughts from out time to future generations. She let us all keep writing!! A wonderful post about an extraordinary artist and his relationship with nature which you conveyed so well. As you know I grew up in Amsterdam and did not realise until I was well grown up, what a huge privilege it was to have this wealth of art always available. Including the Van Gogh Museum, where I went as a little girl with my father, and have been countless times since. Thank you, Rebecca! What a privilege indeed, Elisabeth. To see the actual paintings with the knowledge that the artist crystallized a moment in time, with a blank canvas (and tea towel) and paint. I am grateful for the technology that brings the Van Gogh Museum to my desktop. https://www.vangoghmuseum.nl/en What I most appreciate about our blogging community is that we share knowledge and experience that creates positive actions. We live in a perilously divided world that longs for the knowledge of how to live with hope and expectation. Vincent Van Gogh’s ideas on the connection between art, love, nature empowers our thoughts and invites us to embrace unimaginable possibilities. “For my part I know nothing with any certainty, but the sight of the stars makes me dream.” Vincent Van Gogh. The Van Gogh Museum is a wonderful institution. Thankfully Vincent wrote many letters to his brother Theo, so we know a lot about the importance of nature for his work. I agree that our blogging community is inspiring. I just purchased the audiobook: My Life and Love Are One: Quotations From the Letters of Vincent Van Gogh to His Brother Theo by Vincent Van Gogh, narrated by Jason Zenobia. Looking forward to the “listen.” Welcome to a new week! Lovely. I hate to think how much poorer and less beautiful my world would be if Van Gogh had never painted. In fact I find it hard to imagine my life without Van Gogh’s art in it. Oh how very, very, very well said. I agree wholeheartedly. I remember the first time that I viewed “Starry Night.” It was in a children’s encyclopedia – I was 5 years old. I returned again and again to the “star page” – until it is embedded in my soul. It was years later that I found out that the artist was our beloved Vincent Van Gogh. A gorgeous tribute! Have you read ‘Let me tell you about a man I knew’ by Susan Fletcher? It is a novel about Vincent’s time at the hospital in Saint-Remy and is one of my all time favorite books. Highly recommended! Ahhhh, I love his quote! And you exemplify this quote, my dear friend. Hugs!